Actually, it was Karolina that thought of Julie first. She was the one who was able to convince Molly to reveal Abigail's identity, by saying "Tell us for Julie / we have to help Julie." When the Runaways continued to berate Molly, Karolina again turned the focus back to Julie. "Protecting our own" is kinda scary rhetoric (sounds like Cersei Lannister lol!). Karolina was being compassionate (if naive) by wanting there to be a way to save both her girlfriend and Abigail, which is very much nailing her character down pat. I was so totally down for Team LiteBrite. But then again, drama sells comics, and I guess Julie is too secure in her life to become a Runaway. 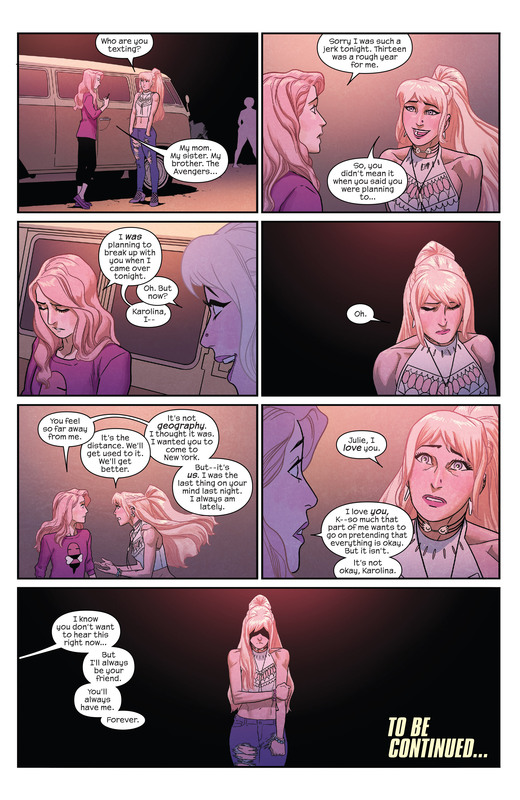 Heck, you could even say that Karolina is regressing a bit, stepping away from her independence and life as an adult-in-the-making to go back to being with her old friends/family. So if they're going in different directions as people, and on opposite coasts, it makes sense that if Karolina isn't as committed to what Julie wants, Julie's going to dump her. 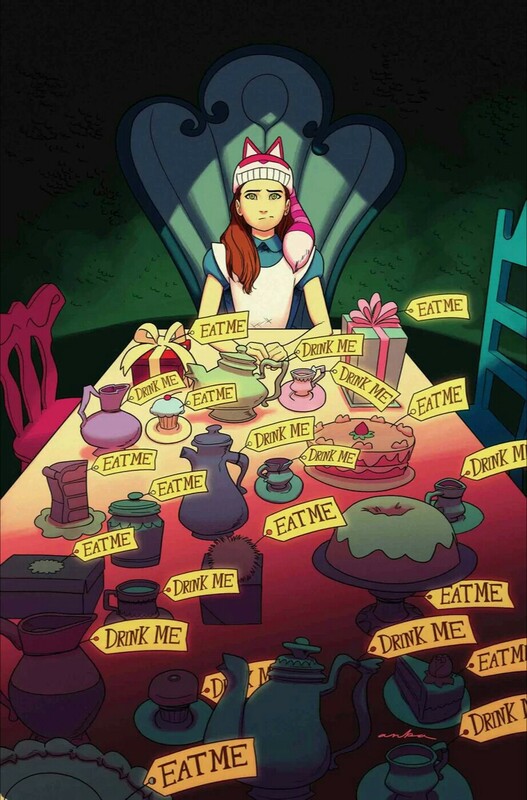 I don't think you could say Karolina is regressing or stepping away from being an adult-in-the-making. Living in a freshman dorm at a private university isn't exactly maturity-building - especially after all Karolina has done and gone through. It's more like living in a bubble. Continuing to support her family of peers - remember, her family is not her parents or the pseudo parental figures of RAs and dorm rules - as well as provide for underage minors, seems like the most mature option to me. I also don't think it's about "drama selling" - seems to be more about solid lgbt representation. 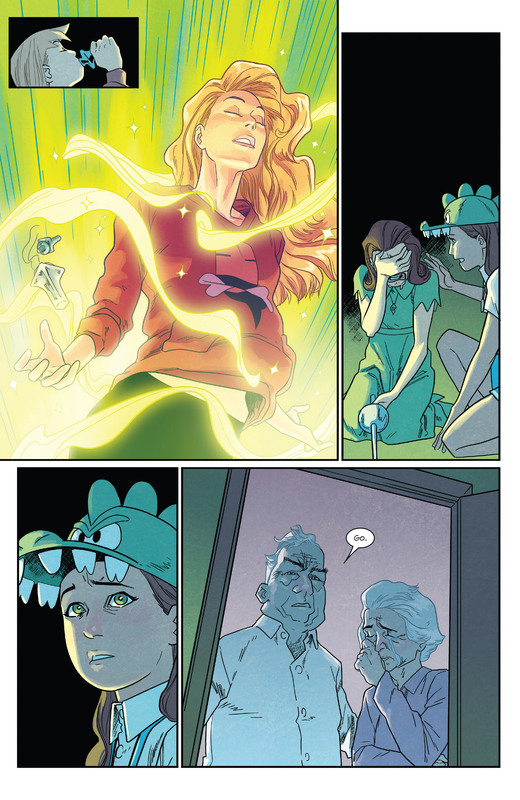 Rowell has spoken about how she wasn't bringing back Klara and Xavin because there were too many existing Runaways to focus on. In that case, it certainly wouldn't make sense to have Julie join the team. Without Julie on the team, scenes of Karolina in a relationship would have been sporadic at best. If Nico and Karolina get together (which it seems like they will), we'll actually have an lgbt couple be two protagonists and main cast members - that's huge. I'm a romantic, so I hate seeing couples break up. Also, I do worry a little that they're going more for TV synergy with Nico/Karolina, when there's a lot less to really support the pairing in the comics. I could be wrong, but I never saw a great deal of potential reciprocation from Nico in the past. But y'know? Rowell brought back Victor, has a solid knowledge of the team's history, and is giving us a fun story, so I trust her to do right by the characters I like. I don't think the show pulled Nico / Karolina out of thin air - they got it from the comics / the comic came first. 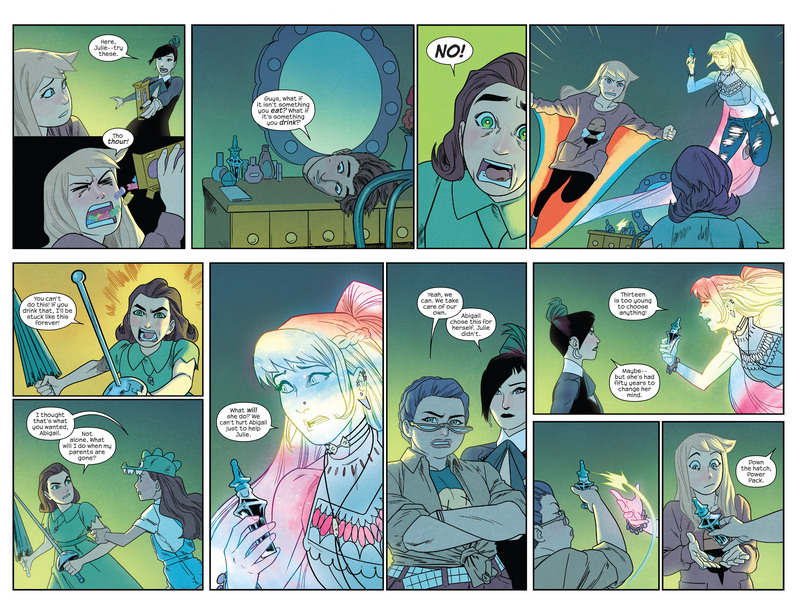 There was a lot of Nico / Karolina stuff going down prior to Rowell's run, but also a lot of inconsistency due to indecision by authors, cancellations, reboots...I could definitely pull a list of scans / scenes. I did a post on Tumblr with all of the scans from Whedon's run for instance (since people tend to forget about that one), and was going to do the classic BKV ones next. All that said, I hope Rowell will not take Nico / Karolina for granted and will take the time to develop their relationship and show them actually having substantial interactions with each other, and vibing as a pair. We'll see. But I'm glad you think it's been good so far :) The comic definitely needs the support of its fans. I hope it'll only get better! Poor Abigail. :( I mean, yeah, she was a bit defensive, but that’s not like she was actually evil or anything. I think they owe it to Abigail to find a way to break the spell. I don’t think Nico’s ever used “grow up” before. I just hope they aren’t breaking up Julie and Karolina just so she and Nico can get together due orders from on high for cross-media synergy. But I get the feeling that’s what’s gonna happen. You can’t have Xavin on the Hulu show until Disney buys Fox and the Skrulls are back in the Marvel Studios fold. Don’t get me wrong, I ship Deanoru but I just want it to be for the right reasons, and editorial/management mandate isn’t one of them. But Xavin has been gone from the comics for awhile now? I'm pretty sure Deanoru happened on the show because the creative team saw that the comics were heading in that direction / that direction was often hinted at in the comics. It's been over a year since the new comics team has been releasing issues consistently and well over a year (some would say 15 years) since Deanoru hints have been laid, so now seems like as right a time as ever. There's been a really slow and deliberate build up of the plot to that point.